This week BTC has recovered nearly 13% and a few altcoins attempting to follow, while a few others surpassed BTC, but will any be able to hold on to their gains. As usual, bitcoin commands the room, hogging all the attention and taking credit for running, or as of late, ruining the cryptocurrency market. Nowadays, the statement that 90%+ of altcoins are tethered to BTC’s hip pricewise is a well supported fact and many believe that altcoins cannot pull off a turnaround until bitcoin sustains gains for longer than 2 or 3 days. Late June through Early July provided some entertainment as Tron and EOS launched their mainnet and the build up in price was satisfying for those holding the tokens but post migration both seem to be languishing. With that said, there were some pleasant surprises this week and NEO and Cardano (ADA) managed to post impressive gains. 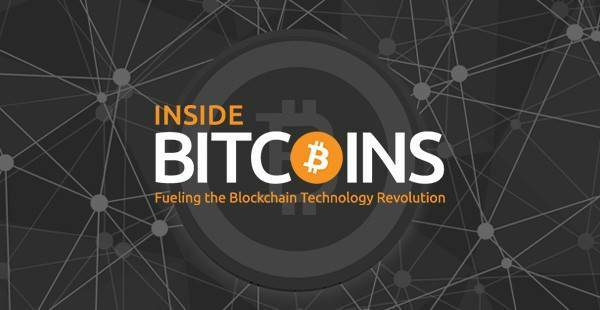 Let’s have a closer look 5 altcoin titans followed by one overlooked ‘alt-guest,’ which will rotate with each post. Currently Ethereum exhibits somewhat bullish behavior as it attempts to surpass the descending trendline and has steady support at $458. At the time of writing, ETH peeps ever so slightly above the descending trendline where the 20-day moving average (MA) is also aligned. 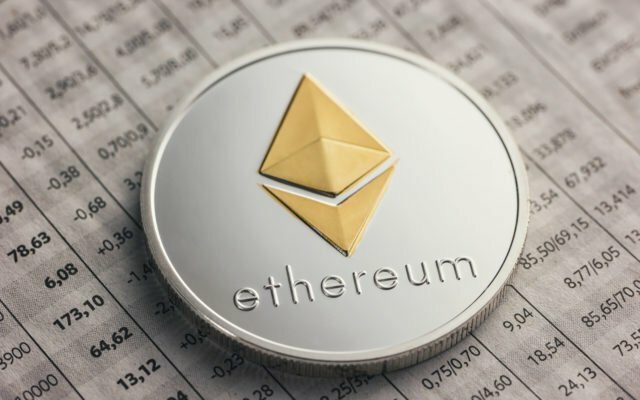 The RSI has flattened in bullish territory ETH is likely to add gains if it can reach $465, which is near the 100 SMA at $467. Strong resistance is present near $478 and ETH will need test this point in coming days in order to maintain the bullish trendline. Hot off the news of the Ontology collaboration and the election of the City of Zion consensus node, NEO appears ready for a trend reversal and in the event that BTC manages to sustain gains NEO is bound to benefit. After gaining 20% this week, the cryptocurrency managed to break through the 6 month long descending channel on some rather high volume moves and spiked at $49 before settling near $42. The RSI also completed the bearish cycle and has since reversed. Since July 5th, NEO began to drop some it’s gains at the time of writing the RSI is on the descent as NEO trades in the slightly beneath the descending channel at $37. The 50-day MA at $45 is the most immediate resistance for NEO, followed by resistance at the 100-day MA near $56. Below $37, NEO has support at $34, $31 and $30 which also serves as an important psychological barrier turned support. Volume tapered back significantly as NEO pulled back and its possible that the current rally is solely driven by NEO’s positie news as the majority of altcoins remain near yearly lows. From a technical standpoint, NEO does appear ready for a reversal but the same could be said for the majority of altcoins. 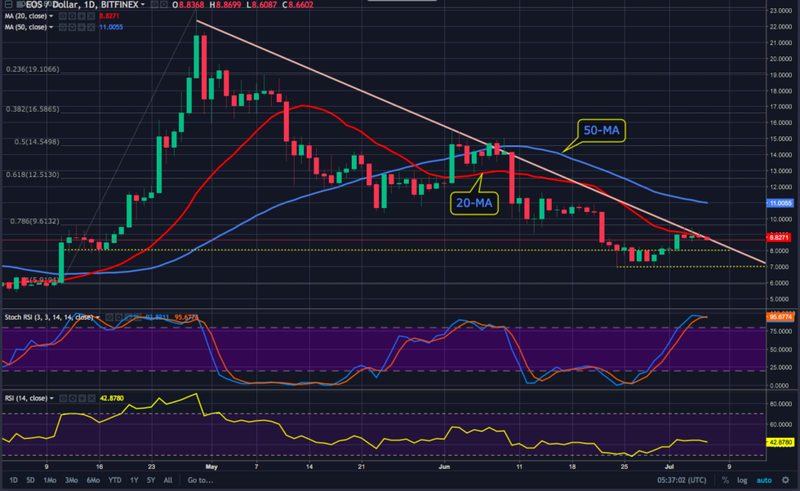 EOS Similar to a host of other alts, EOS currently flirts with the descending trendline where the 20-day MA aligns at $8.40. 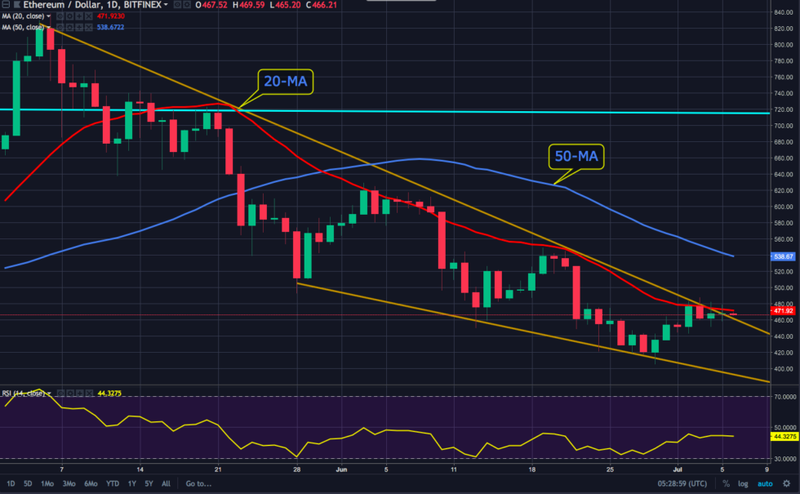 The cryptocurrency is currently range bound, pinned between $8 and $9 as bulls attempt to hold the current gains from the jump from $8 on July 2nd and bears try to defend the 20-day MA. If EOS is unable to pass and hold above the descending trendline at $8.74 we are likely to return to support at $8.00. Below this point, EOS has support at $7.87 and $7.39. 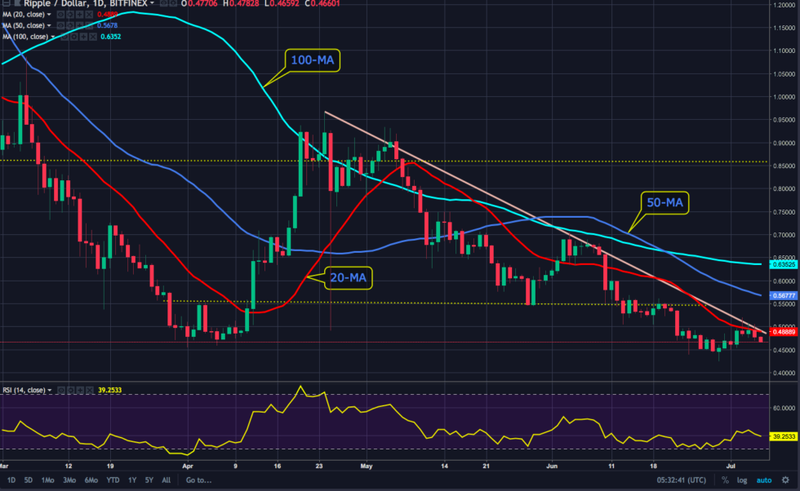 Given the range bound trading that EOS has exhibited after dropping after the exciting mainnet launch, the cryptocurrency should stay above the descending trendline for a few days before attracting strong buying interest. 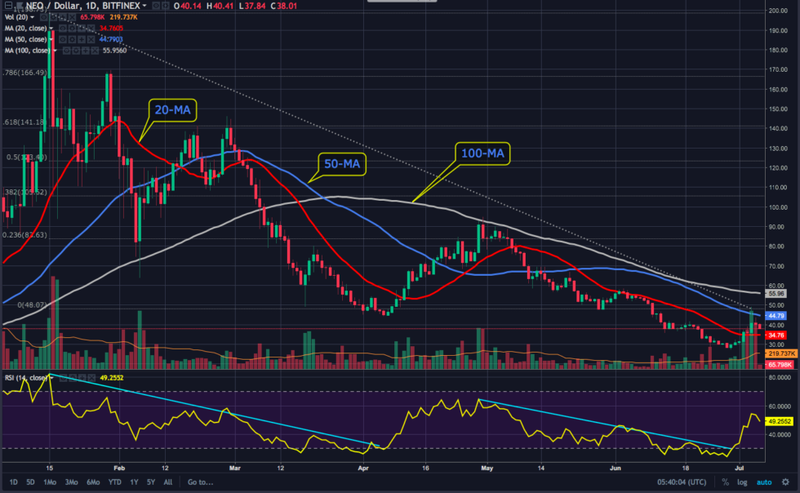 After racking up some impressive gains since June 29th, ADA finally ran out of steam and failed to hold above the bullish trendline at $0.15 and has since dipped below the 20-day MA. At the time of writing, ADA rests on the 100-day MA with support at $0.145 and the overall setup is quite bearish. $0.1350 is the most immediate support, followed by $0.1253. Above $0.16 ADA has slight resistance at $0.18 and could extend to $0.22 if it overcomes both resistance levels. Traders should hold tight until ADA sustains above $0.15 – $0.16 on the 4 hour chart. After briefly escaping the descending channel, XRP met resistance at $0.50 and sold its way back under the 20-day MA to the $0.48 support. 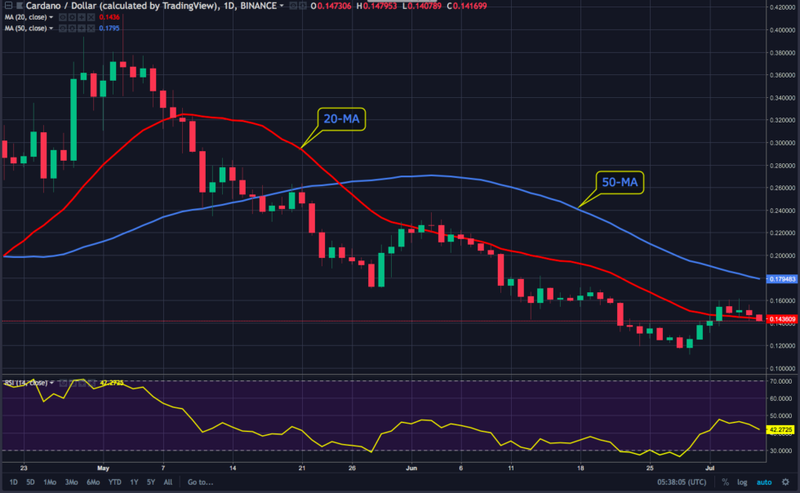 XRP currently trades at $0.46 with strong support at $0.45 and a glance at the RSI shows frequent turnarounds at the 40. The short term setup is somewhat bearish and the RSI hovers right below 40 in the bearish zone. Historically, XRP has a strong base at $0.45 – $0.48 and tends to recover well from this point, meaning the cryptocurrency could be in for a few days of range bound trading before breaking toward $0.48 again. Sadly, GoByte are not listed on TradingView but as a somewhat overlooked cryptocurrency it deserves a little attention for its performance from June to July. Since topping out at $80.27 during the euphoric 2017 bull run, GBX has slumped heavily, retreating all the way to $2.32 at the time of writing. What is delicious about the cryptocurrency is it’s frequent 10 – 15% bi and tri-weekly pops and the occurrence has been a swing traders delight. 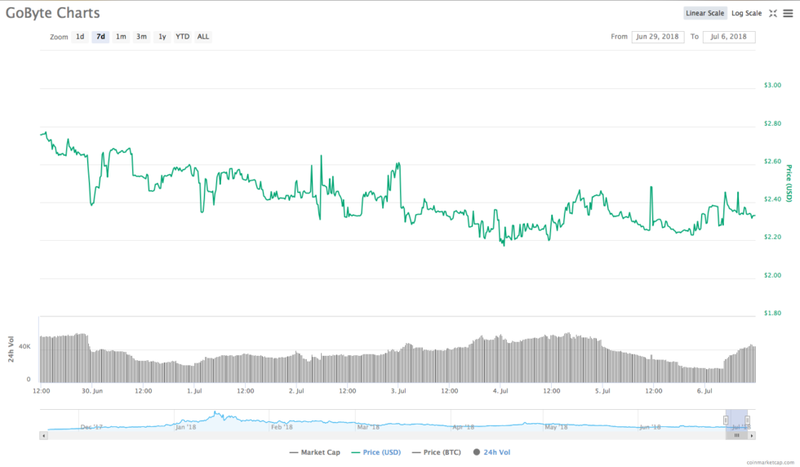 From 14th June, GBX spiked from $2.88 to $7.49 and in the following weeks has frequently popped from $3.44 to $4.55 and again in early July $2.88 to $3.98. For the time being, it seems the new reality of low volume and ailing bitcoin prices have extinguished the viability of long trades and with the top 10 alts either pinned to BTCs hip or range trading in scenarios that don’t offer a sensible risk-reward ratio, traders would be wise to look past the top 10 through 50 cryptocurrencies as there are still rewarding swing trades to be made. We would have loved to have mentioned, ELA, IOST, ETC or a few others but as the post is getting long in the tooth, it’s best to call it a day. Until next time, happy trades my friends, and may the odds ever be in your favour. The post Ethereum Price Analysis — Plus NEO, EOS, ADA, XRP, GBX appeared first on Bitcoinist.com.